Everybody was tired of all this fighting and killing. And everyone was afraid of Octavian. So when Octavian just kept ruling almost as if he were king, nobody tried to stop him. He made people call him Augustus (which means The Good) instead of Octavian. But he was smarter than his uncle Julius Caesar had been. Augustus didn’t call himself dictator. He said he was just the First Citizen. He didn’t disband the Senate. Instead, he made the Senate do what he wanted. And he had himself elected tribune, so he could veto whatever the Senate did that he didn’t like. People knew that Augustus was really taking over, but as long as there was peace and he didn’t SAY he was taking over, it was okay with them. Augustus lived a long time, until 14 AD. When he died, hardly anyone could remember before he was in power, or all they remembered was killing and blood. 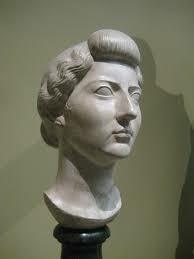 His son-in-law (his daughter Julia’s husband) Tiberius took over as First Citizen. Tiberius wasn’t really a very good ruler (we call them emperors now, but they didn’t call themselves that). He spent a lot of time swimming and having big parties. He left most of the work to his assistants. But still people thought that was better than civil war. 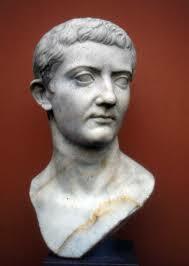 Tiberius died in 37 AD, and his nephew Germanicus’ son Gaius, who is often called Caligula, took over. 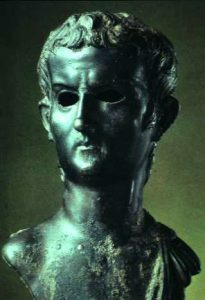 Caligula wasn’t too bad at first, but he seems to have suffered from mental illness. After a while he started doing things like trying to make his horse a senator, and trying to marry his sister. By 41 AD people decided he was too hard to deal with and his own guards killed him. After Caligula was killed, Caligula‘s uncle Claudius took over. He did better than people expected. In his reign the Romans succeeded in conquering England and making it into another province. But Claudius’ wife Agrippina poisoned him (according to the Roman historian Suetonius) with bad mushrooms, and he died. In 54 AD, therefore, Claudius’ stepson Nero took the throne. 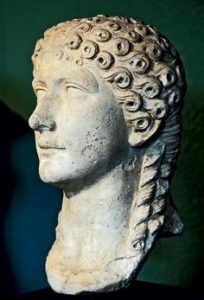 Nero was only 16, and his mother Agrippina really controlled politics through him (because women could not be tribunes or senators), until Nero was in his mid-20s. But then he decided he would rather rule on his own, and had his mother killed. Nero may be best known for how he handled the Great Fire at Rome in 64 AD. People were blaming him for the fire, and so he rounded up a lot of Christians and had them burned alive as if the fire was their fault. St. Peter and St. Paul probably also were martyred (killed) during Nero’s reign. 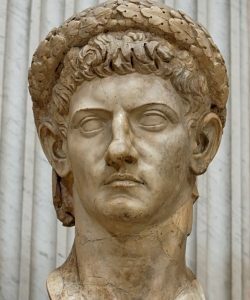 After he killed Agrippina, Nero became unpopular with the Senate, and in 68 AD the governor of Spain, Galba, revolted against him and marched his army toward Rome. When it was clear that he was going to lose, Nero killed himself. 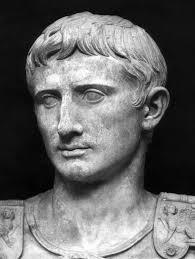 He was the last ruler from the family of Julius Caesar and Augustus. Classical Rome, by John Clare (1993). For kids, the whole political history from beginning to end. Oxford First Ancient History, by Roy Burrell (reissued 1997). Easy reading. It skips around a lot, not trying to tell everything, just highlights. The Romans: From Village to Empire, by Mary Boatwright, Daniel Gargola, and Richard Talbert (2004). Okay, it’s a little dry, but it is up to date and has all the facts you could want. The Roman Revolution, by Ronald Syme (1960). Still a classic. by H. H. Scullard (1959, 5th edition 1990). Another classic. Cite this page: Carr, K.E. Julio-Claudian emperors – ancient Rome. Quatr.us Study Guides, September 3, 2017. Web. April 19, 2019.